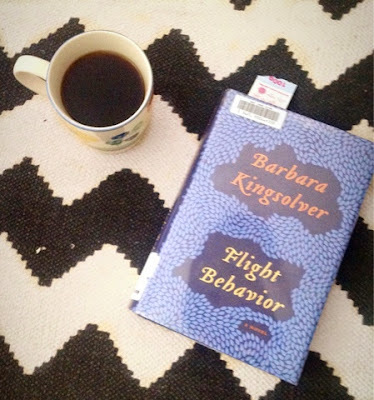 What I'm Reading: Flight Behavior by Barbara Kingsolver | Oh Sarah O ! I just finished reading the A Beautiful Mess August book club pick Flight Behavior by Barbara Kingsolver. This means I'm all caught up! Prior to picking up this book for the book club, I was unfamiliar with Barbara Kingsolvers work which appears to favor themes of social justice, biodiversity and environmentalism and this book is not exception. Flight Behavior tells the story of a woman from rural, poverty stricken Appalachia who is ready to change her life forever when she discovers that thousands of monarch butterflies have migrated onto her property. As word about the butterflies spreads, visitors flock to her farm to see the butterflies and question whether the butterflies arrival is a miracle or a terrible sign that global warming has disturbed the butterflies migratory patterns. I was unsure how I felt about this book when it was finished. I found the story difficult to get into at first, but after the first 50 pages I blazed through the book. I enjoyed most of the characters, but there wasn't any character that I particularly related to. And I enjoyed reading about the debates between miracle vs. science. I guess my takeaway is that I enjoyed the book, but it didn't encourage me to read Barbara Kingsolver's full body of work. Next I'm going to share my thoughts on some of the discussion points from the discussion guide by Emma at A Beautiful Mess. Warning: Spoilers ahead! 1) An obvious easy place to start: the title. What the heck is flight behavior? As Emma pointed out, flight behavior is an obvious reference to the butterflies and their strange new migration pattern that lead them to Dellarobia's property in Appalachia instead of their usual roosting place in Mexico. Also, the title could also be a reference to Dellarobia's behavior throughout the book: how we meet Dellarobia as she is climbing up to her small cabin with the intent to commit adultery; how Dellarobia's encounter with the butterflies changes the direction of her life from being Cub's wife and a stay-at-home mother- playing a more supportive role to someone who pursues her own interests and can do things on her own; And how Dellarobia leaves her marriage in order to move in with her high school friend, Dovey, and begin her college career. Like the butterflies, Dellarobia appears to have steered her life off coarse due to an unforeseen accident. We learn that Dellarobia originally had intentions to go to college to study English, but her plans were put on hold when she became pregnant with her and Cub's first child that was still-born. That pregnancy lead to her and Cub getting married and the life she had throughout the story. The story differs in that Dellarobia was able to steer her flight back onto (or near-to) it's original path, but it is unclear if the butterflies will be able to survive and return to their original flight path. After working with the Dr. Ovid and the scientists, Dr. Ovid helped her to enroll in the local community college and secure a work study program and she separated from Cub. This story introduces us to many different characters: Dellarobia; her husband, Cub; father-in-law-, Bear; mother-in-law, Hester; the scientist, Dr. Ovid Byron; the minister, Bobby; the children, Preston and Cordelia; best friend, Dovey; and so on. Not only does Dellarobia undergo a change throughout the story, but her mother-in-law, Hester, does as well. When we are first introduced to Hester she is the matriarch of the family and appears to be constantly displeased with her son, Cub, and an uncaring grandmother. But as the book progresses, Hester appears to take an interest in the butterflies as she starts taking tourists to see the butterflies and she takes a stand against her husband's desire to cut down and log the trees on their property (which would destroy the area the butterflies were nesting) and sides with Dellarobia to protect the butterflies. Later we learn that Hester also became pregnant at a young age (by someone other than Bear) and she gave up that child for adoption. When Hester married Bear she agreed not to discuss the child she had with the other man, but we soon discover that her first-born is now the town minister, Bobby. So we learn that Hester and Dellarobia actually have something in common as they both felt trapped into their marriages. I really liked reading about Dellarobia's inquisitive, 5-year-old son, Preston and the relationship he developed with Dr. Ovid. Their relationship made me hopeful that Dr. Ovid's influence on Preston at an early age would encourage and influence him to become a veterinarian or scientist and break the family cycle of poverty. 3) Let's discus the environmental themes. What did you think of how Ovid's world (science, upper of middle class, educated) and the world surrounding Dellarobia (religious, poverty, under-educated due to less opportunity) view the events that surround the butterflies? Do you think their viewpoints are fair? Have you seen this kind of issue come up in your community? In the book, the people of Feathertown (Dellarobia's town) view the appearance of the butterflies as a miracle, Preston's classmate said that in Mexico they believe the butterflies represent the soles of deceased children, and Dr. Ovid views the butterflies appearances and a sign of environmental crisis due to global warming. Many of Dellarobia's family and community members believe that global warming is a myth while Dr. Ovid is alarmed that anyone would ignore all evidence to the contrary. I tend to favor the perspective of the scientific community, so I, like Ovid, find it difficult to understand how members of the Feathertown community can ignore scientific evidence or discount them as just 'theories'. Being born and raised in Kansas (aka. The Bible Belt), I see issues between the religious vs. scientific and upper class vs. lower class all the time. One example was the debate on whether evolution should be taught in schools which took place when I was in high school. Many religious people argued that it should not be taught in schools because they favored creationism, while others argued that evolution should be taught in school or that evolution and creationism should both be taught in school simultaneously. Lucky for me, my science teacher (who was a Catholic) favored the latter view and mentioned both evolution and creationism in class so that we the students could form our own theories and beliefs- a decision I agree with. I also enjoyed Ovid's confrontation of the news reporter that shined light on the idea of the news media emphasizing the wrong issues and emphasizing sensationalism over facts. Now that I've finished this book, I've got butterflies on the brain. Maybe I'll draw some pictures of butterflies. The book club pick for September is Middlesex by Jeffery Eugenides and the discussion will take place on A Beautiful Mess at the end of September. Will you be reading the book? Have you already read the book (or Flight Behavior)? Let me know in the comments below.